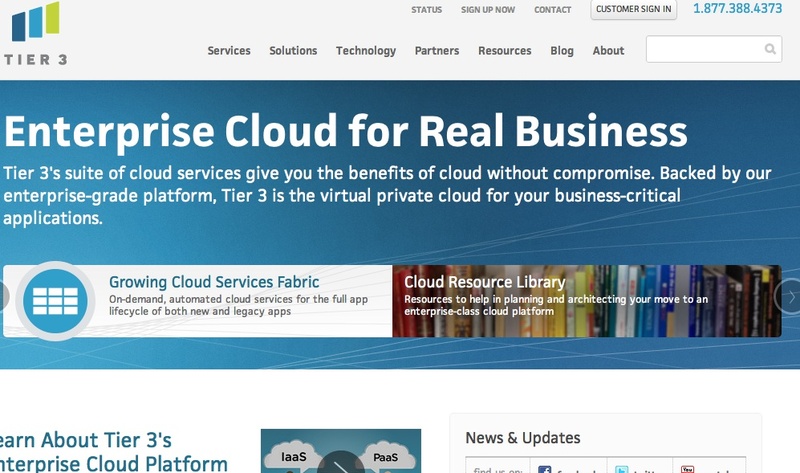 Up-and-coming cloud provider Tier 3 is getting into the platform-as-a-service space with a new offering based upon VMware’s (s vmw) open source Cloud Foundry project, as well as a plethora of cloud database options. The new PaaS, called Web Fabric, is built on Tier3’s previously announced Iron Foundry implementation of Cloud Foundry that adds support for the Microsoft .NET framework. VMware itself, which is locked in a death match with Microsoft, is not disposed to support .NET, although Cloud Foundry natively supports multiple languages and frameworks, including Java, Ruby, PHP and Python. Tier 3 also unveiled a suite of database services, called Data Fabric, that will give customers the option of running MongoDB, Redis, SQL Server, MySQL(s ORCL) or PostGres databases that can connect to Web Fabric, Tier 3’s flagship infrastructure-as-a-service servers or even external applications. Those services should be live June 1, the company said. A company spokeswoman said Tier 3’s enterprise customers will be able to access and manage their IaaS,PaaS and database services from a single console — an attractive proposition. This news should be of interest to companies that want to experiment with PaaS and database services in an enterprise-class cloud, which is how Tier 3 positions its services. It also shows that the world isn’t standing still waiting for other IaaS players to get their acts together. “Rackspace(s rax) is barely getting their OpenStack IaaS up and running and here’s an IaaS running vCloud for more than a year and now offering PaaS,” said GigaOM Pro analyst Jo Maitland. From IaaS to PaaS, Tier 3 is able to deliver a consistent enterprise cloud strategy with high availability, security and interoperability in mind. Whether it can transition enterprise IT managers, which are likely involved in early testing and development-type ad hoc cloud projects, to becoming PaaS customers in large numbers remains to be seen, but its offer of enterprise production support, platform automation and integration seems to match the demands of business organizations as they come to the end of the technology lifecycle. Tier 3 has been busily expanding its business. In February, it announced a federated cloud platform that lets service providers deploy white-label clouds based on Tier3’s software and leverage the geographic footprint of other Tier 3 partners. That means, for example, that a service provider in Indiana could offer customers access to resources anywhere in the world where another Tier 3-based service provider is operating. The state of the IaaS/PaaS market will doubtless come up at GigaOM’s Structure event in June where one panel will feature AppFog’s Lucas Carlson, DotCloud’s Solomon Hykes, and Derek Collison, the man behind Cloud Foundry and new co-founder and CEO of Apcera.